At The CLEI Center for Keratoconus, we are currently conducting clinical trials of corneal collagen crosslinking (CXL). The clinical trials are designed to study the benefits and safety of corneal collagen crosslinking in patients with either keratoconus or corneal ectasia after previous refractive surgery. The goal of CXL is to decrease the progression of these corneal thinning disorders. We have been participating in CXL treatments in formal clinical trials for over four years and have performed more than 200 procedures to date. See www.clinicaltrials.gov for general information regarding clinical trials, including crosslinking. Collagen crosslinking using ultraviolet (UV) light combined with riboflavin (Vitamin B2) is an investigational procedure currently being performed in Europe and elsewhere outside the United States. It is not approved for general clinical use in the United States. However, here at the CLEI Center for Keratoconus, we are carrying out formal studies of CXL that are being conducted under FDA guidelines. The goal of our studies are to assess the safety and efficacy of crosslinking for the treatment of keratoconus as well as corneal ectasia after LASIK. 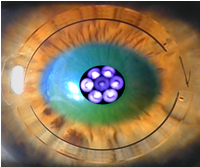 The primary goal of collagen crosslinking in the keratoconic patient is to strengthen and stiffen the corneal fibers in order to decrease the progression of keratoconus, and to decrease the cone steepness in some patients. The safety and efficacy of crosslinking, as yet, is unclear, although results from U.S. and European studies are encouraging. CXL is performed at the state of the art CLEI Center for Keratoconus by Dr. Peter Hersh. Anesthesia drops keep you comfortable and a lid retainer prevents you from blinking. The surface epithelial cells of the cornea are then removed and riboflavin drops are administered for 30 minutes. The riboflavin acts both to enhance the crosslinking effect and to protect the rest of the eye from the UV exposure. The patient then looks at a UV emitting light (wavelength = 365 microns, power = 3.0 mW/cm2) for 30 additional minutes with continued administration of riboflavin drops. At the conclusion of the procedure, a soft contact lens bandage is applied. 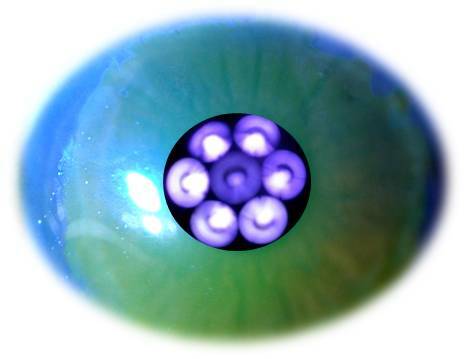 The contact lens is left in place to improve healing for approximately 5 days and is then removed. Antibiotic and anti-inflammatory drops are used for two weeks afterwards. Please see below for details of our current crosslinking trials and articles written by Dr. Hersh and staff on crosslinking and results thus far. We are not currently enrolling patients for our crosslinking clinical trials but please check back for future enrollment. If you have an interest or have any questions, please call our office at 201-883-0505. Will CXL Get Approval in 2016? We are currently enrolling patients in a clinical study looking at the effectiveness of combined Intacs and corneal collagen crosslinking (CXL) in patients with either keratoconus or corneal ectasia after previous LASIK. This trial will evaluate the benefits and safety of a combined Intacs and CXL procedure. The second objective of the study is to compare the timing of the 2 procedures on clinical outcomes. For further information and inquiries about this Keratoconus crosslinking study, please call 201-883-0505 or email info@vision-institute.com. We are currently enrolling patients in a clinical trial of corneal collagen crosslinking (CXL) for keratoconus and corneal ectasia after previous refractive surgery. The objective of this study is to investigate any difference between 2 riboflavin preparations during UV administration. The first preparation contains riboflavin in a dextran solution, which may tend to draw water out of the cornea and keep it thinner. The second preparation contains riboflavin in a hypotonic (low salt) solution without dextran, which may tend to keep the cornea more swollen. The primary goal of the study is to see if the use of hypotonic riboflavin (rather than riboflavin with dextran) better maintains consistent corneal thickness during UV administration. The second goal of the study is to determine if better maintenance of corneal thickness potentially could have benefits of better consistency of the procedure, decrease in corneal haze formation, and improved safety of the endothelial cells. For further information about the trial call 201-883-0505 or email info@vision-institute.com. We are pleased to announce a new clinical trial of transepithelial corneal collagen crosslinking (CXL) for keratoconus and corneal ectasia after previous refractive surgery. This study compares two variants of transepithelial crosslinking, otherwise know as “epi-on” crosslinking. All subjects will undergo pre-treatment with a topical anesthetic (to improve riboflavin absorption) and riboflavin 0.1% for 60 minutes. During UV irradiation, subjects will be randomized to receive one of two treatments - administration of riboflavin every 1 minute with UV light or administration of riboflavin every 2 minutes with UV light. The primary goal is to evaluate efficacy of the two transepithelial procedures. The second goal is to determine if there is equivalency between groups. Transepithelial crosslinking, in which the epithelium is not removed, has been proposed to offer a number of advantages over traditional crosslinking including an increased safety profile by reducing the risk of infection as no epithelial barrier will be broken, faster visual recover, and improved patient comfort in the early postoperative healing period since re-epithelialization is not required. For further information about the trial, call 201-883-0505 or email info@vision-institute.com. Dr. Hersh and the CLEI Center for Keratoconus are pleased to announce a new clinical trial of the The Vedera KXS Microwave System with Corneal Collagen Crosslinking (Keraflex). This study compares this treatment to corneal collagen crosslinking alone. All patients in the study will be randomly assigned to one of two treatment groups (either Keraflex and Crosslinking, or Crosslinking alone). 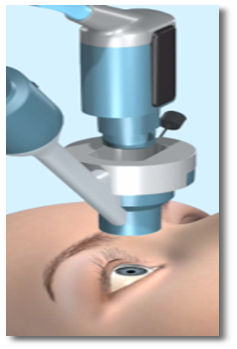 Keraflex is a non-incisional procedure designed to flatten the cornea in keratoconus. During the Keraflex procedure, the Vedera KXS delivers a single low energy microwave pulse lasting less than a second. The energy is applied to the cornea using a microwave emitter which contacts the surface of the cornea. This raises the temperature of the selected region of the cornea, shrinking the collagen and forming either a a circular or semicircular application spot in the upper region of the cornea around the keratoconic cone. This results in reshaping of the cornea, with the goal of flattening the cone in keratoconus. The Keraflex procedure is done using a topical anesthetic drop for comfort. In the corneal collagen crosslinking procedure, the surface epithelial cells are first removed and riboflavin drops are then administered. This is followed by UV light application. Generally, a contact lens bandage is applied to aid in healing and comfort after the procedure. This presents the basic optical and vision results after crosslinking. This study looks at the healing course after corneal crosslinking and helps doctors understand what to look for at different timepoints in their CXL patients. The specific optical changes of the cornea are investigated in this article. Generally, corneal optics improve after crosslinking. Corneal thickness changes after CXL are evaluated. The cornea tends to become thinner for 3 months after crosslinking and then thickens back to baseline. Using a new instrument to evaluate corneal biomechanics, changes in corneal strength after crosslinking are explored. Using wavefront analysis, higher order aberrations (visual static) are quantified before and after crosslinking. In general, visual static improves after crosslinking. Keratoconus patients assess their visual symptoms before and after crosslinking. On average, patients notice improvement of a number of symptoms.